The last 2 weeks have flown by. The transition from the solitude of the the Nothern Territory in to the social whirlwind of the Sunshine Coast took place seamlessly. Christmas too has started creeping in. In Emerald I drove around with Neal, a fellow biker who kindly put me up for the night, to check out the Christmas lights in town. Some neighbourhoods certainly do make an effort. 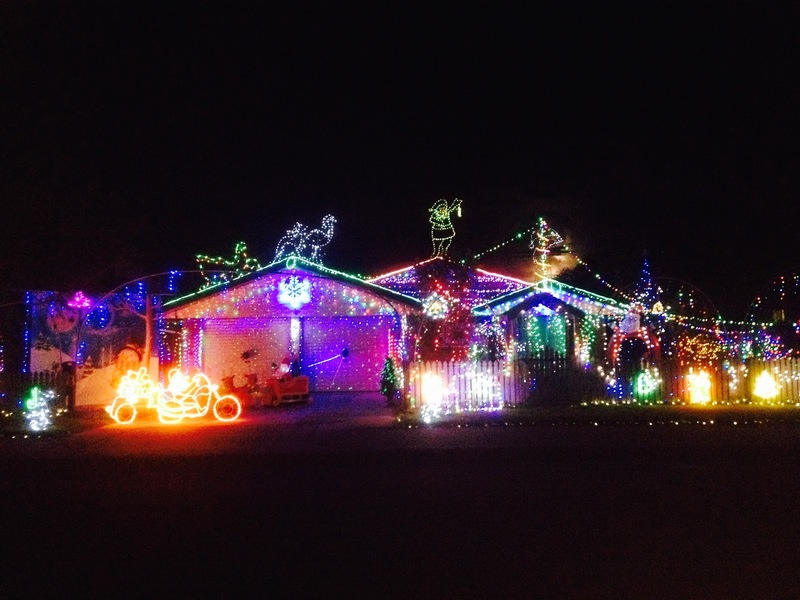 I particularly liked the ones that had Kangaroo lights with Christmas hats on! Now THAT is what I call an Australian Christmas! The show however, was stolen by mother natures lights that night. I have never seen such an active display of lightning. Wonderful. 8 months in and I find myself sitting on the the plane destined for Australia. My third continent. It’s funny how the emotions hit you all of a sudden as if you have just woken up and realised what is happening. 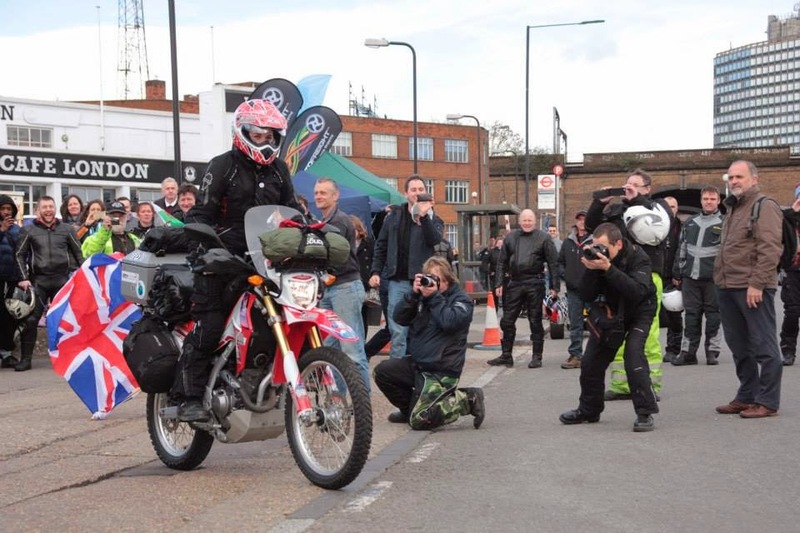 I have a big smile and a giggle as It dawns on me that I have covered 20,000 miles over 2 contents on my little CRF250L. It’s hard to believe that we have made it to the other side of the world together. My first few days in Darwin were easy thanks to some fellow bikers. Tim and his family put me up for the first two nights and then I moved over to stay with Elizabeth and Sam in their rural home about 40k out of town. What a great place. A lovely 1930s wooden house surrounded my 6 acres of woodland and full of wildlife. My last few days in Indonesia were spent in Bali with Jonathan, Imelda and their 4 lovely Beagles Minx, Max, Dylan and Bella! They all had to get a mention as they have all kept me highly entertained in between my shipping stresses and general running around. To be honest most of my time here was spent sorting the shipping debacle after the company I was dealing with (Green Air - Don't use them!!) palleted my bike and then tried to charge me 3 times the weight of the bike. It took two days to sort out the long sordid mess and a lot of effort and emotion went in to finding a solution. It was not the perfect solution as I still ended up paying a lot more than I had originally calculated but we had to move forward and I had no time to find another agent. I have come out slightly wiser and slightly greyer but we are on our way! 20,000 miles and still going! Leaving the city of Balikpapan, East Borneo behind we hit the country roads and headed for the forest. My driver spoke very little English, but he had been sent to collect me from Samoja Lestari and ensure I got supplies of food etc on route. We spoke very little on the way due to the language barrier. Instead I watched the landscape go by and took in my new surroundings once more. As we turned off the road and on to the dirt tracks, he looked at me with a wry smile and simply said "Welcome to the Jungle" in a really thick Indonesian accent. We both burst out laughing. There was no need to ask if he was a Guns N Roses fan or indeed, if he had used that line before! "My wife just got back from Indonesia"
"No she went by plane!" I thought I would start with some light entertainment after the stresses of the last week! This was the best I could come up with! The subframe is now fixed and stronger than ever (I hope) thanks to Syndicate Motors Kalimalang and my Garmin is now fully functional again. However, thanks to the Ferries here being totally unreliable (they put back the sailing date several times), I am now unable to take Rhonda over to Borneo as I am just a little too behind schedule to risk it. If I don't make my shipping for Australia in time then I run the risk of missing my boat from South America to Antarctica further down the line. It's all got a little tight all of a sudden and something had to give! There is certainly never a dull moment! The path of true adventure is never a smooth one and after 7 months of rough roads and mountain trails, Rhonda's subframe snapped! I don't think anyone will be overly suprised at this. I was certainly under no illusions that this was a distinct possibility. 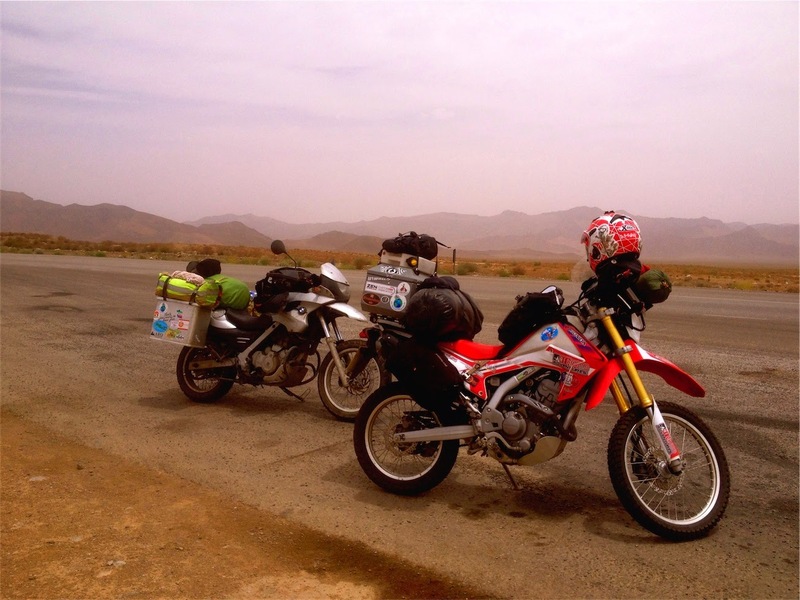 The CRF250L was not really designed with world travel in mind and so all this luggage had to take it's toll at some point. Particularly as the top box sits so far back on the bike. However, despite my concerns before leaving, I decided to leave the frame as stock and see just how much it could take. Tim from MotoBreaks (ironic name considering) was kind enough to back up my decision by purchasing a spare subframe before I left with a promise of flying out to the rescue if it went horribly wrong. That was reassuring to know and a great excuse for him to have a last minute adventure of course!! Lovina Krui Surf bungalows appeared out of the dusk in the nick of time. It was the end of another very long day in the saddle. I had been riding for 11 hours, the light was fading and I had eaten enough dust to give Dyson a run for it's money. It's nearly two weeks since I got Rhonda back and hit the roads of Sumatra and it's not all together been plain sailing. The GPS has completely given up now and so where as before it would switch off when things got complicated, it now switches off as soon as it has booted up. It's like it wakes up realises it just can't do Sumatra and shuts down again quickly. Too tired to care anymore. My Poor overworked GPS has finally decided to call it a day. I call him Marvin! RIP Marvin! He just couldn't take the pace. All bikers are equal but some are more equal than others! I've never been a fan of biker clubs. At least I have never felt the urge to join one. I guess that stems from my early days when biker clubs meant an army of rebels who wore the patch and the patch meant total loyalty and total submission of your rights as an individual to your Chairman. I always found this ironic for people who claimed to be rebels. If your leader said jump you jumped. If your leader said set your hair on fire and pull your teeth out whilst singing "sweet home Alabama" then that was what you would do. New recruits, or prospects who were still to earn their patch would be subjected to all manner of tasks and challenges. Mostly illegal, some downright barbaric. Women were not considered eligible to earn a patch. Women probably had more sense than to even try! I felt this thank you deserved a post of its own so here goes. 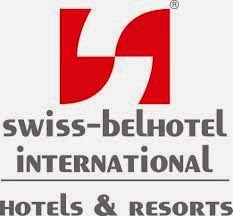 The Swiss-Belhotel offered to put me up in Medan while I waited for my bike to arrive on the onion boat. They have been the perfect hosts, providing me with a lift from the airport, a complimentary massage, food and beverages during my stay. 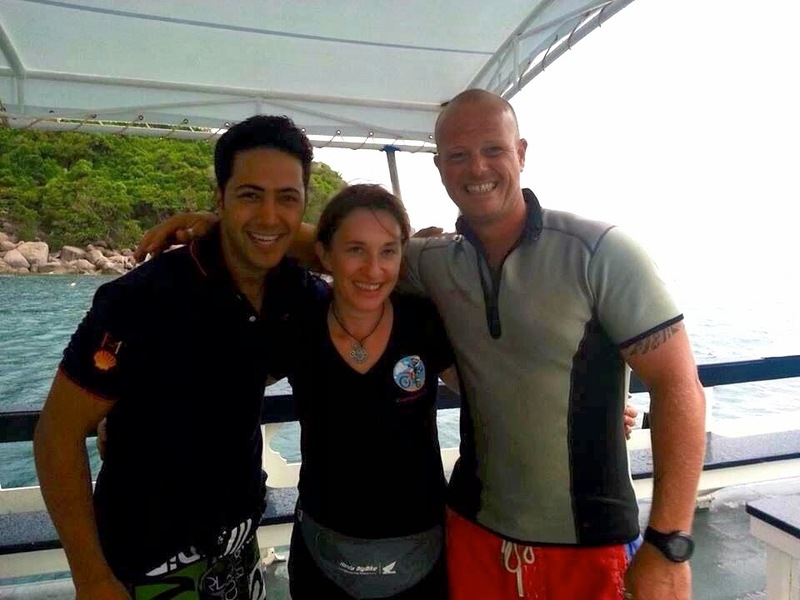 The team here have been so friendly and helpful and all speak very good English. They even lent me a camera as mine is with the bike. It has been wonderful to have such a friendly base during my stay in Medan. I will be sad to say goodbye to the team tomorrow but I hope to stay in touch with some of them and who knows, they may see me again!! THANK YOU SO MUCH for making my time here a comfortable and memorable one and especially for helping with my budget. I still have a long way to go but you have made it that little bit easier. Special thanks to Agus, Herman and Selamat!!! PS - I can highly recommend the Spag Bol!! May the roads be twisty and the facts be straight! "Hello Madam are in there?" I stirred unwillingly out of a heavy slumber and looked at my watch. It was 11.30am. "Hello yes who is it?" I said with the rough, slightly confused voice of a person who had been up drinking whisky until 5am. Probably because I had been up drinking whiskey until 5am! "Madam you need to get up"
I grabbed a towel and threw it around me. Hiding partly behind the door I opened it to see three proud smiling faces. Faces of people I could tell could not wait to share with me what they had done! "We have arranged a press conference for you. You must get up. They will be here at 2pm. The English and the Chinese papers for the WHOLE of Malaysia." Big emphasis on "Whole"
I woke with a smile as I heard the monkeys banging about on the roof of my cabin. It was preferable to an alarm clock and once again it reminded me that I was lucky to be here. I won't lie to you. 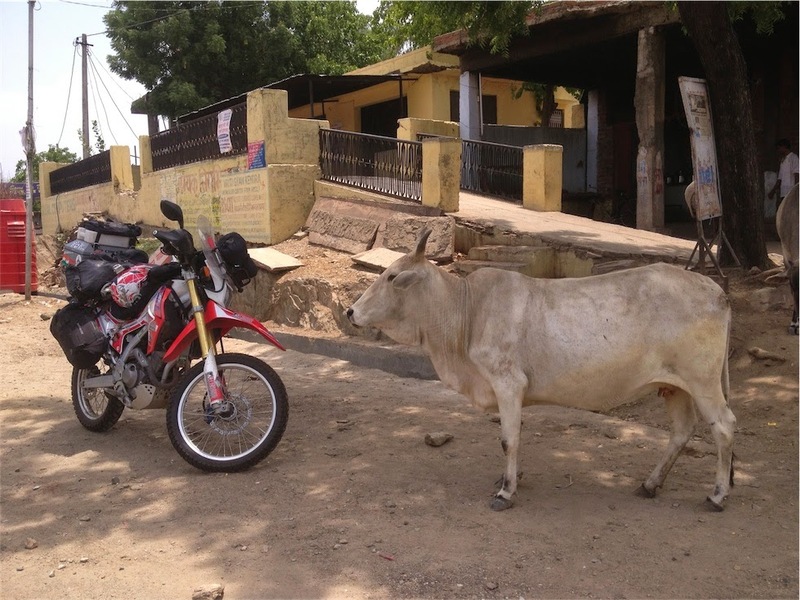 Riding around the world on a 250cc motorbike can be challenging at times. I said I wanted to be able to "see and feel everything". Well somedays you feel it more than others. I'm not sure why it hits when it does but some days just feel like hard work. I guess this time my energy levels were still low after a bug that had put me in bed for a day and a half. I'm always grumpy when I'm ill and Rhonda was not helping! We had fallen out! I could have been forgiven for forgetting I was in Malaysia. As I sat in the English garden on white victorian chairs in front of the Tudor house enjoying cream tea I was transported back home. The only thing that gave it away was the fact that the sun was shinning and, well, I can't tell you the last time I had a cream tea in the UK! "The only thing that's missing here is the red telephone box" I said to my Malaysian side kick, Keith. He smiled and led me to the side of the building where, sure enough, stood a red telephone box. Ye Olde Smoke House in the Cameron Highlands is a must visit if you find yourself riding this beautiful part of Malaysia. I have had such a wonderful time in Thailand. Meeting so many fellow bikers (now good friends) along the way. People who have supported me, showed me great riding roads, put me up in their homes and generally showed their support in any way they can. The welcome has been overwhelming and I am honoured to have met you all. Thank you. Thailand is a beautiful country with a lot to offer any bikers wishing to travel it's roads. 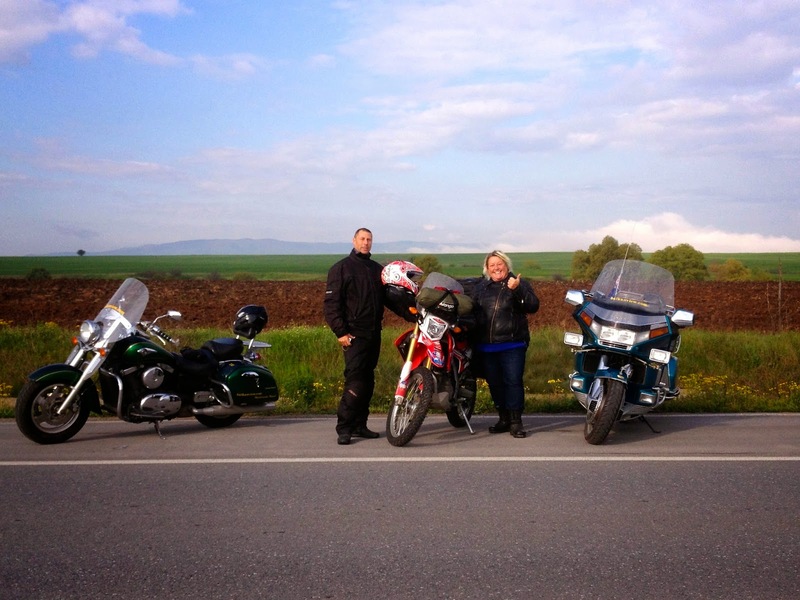 The riding is diverse, the people are pleasant and the food alone is worth a visit. Whether you want on road or off road action, there is certainly enough to keep you busy! I rode North to South and East to West but I still feel I have barely scratched to surface and I look forward to visiting again some day. I imagined diving to be like flying. Gliding through the water in a state of weightlessness, exploring the hidden depth of a different world and finding creatures that you couldn't have imagined sharing the same planet as you. For some this is exactly what it is like. My Iranian friend, Arash, had joined me for this experience and I was a little nervous for him as he had been expressing some concerns all morning. He seemed genuinely nervous and I reassured him, telling him it was going to be easy once we got in the water. He said he would copy what I did. I giggled and suggested that if I looked like I was drowning then he should do his own thing. 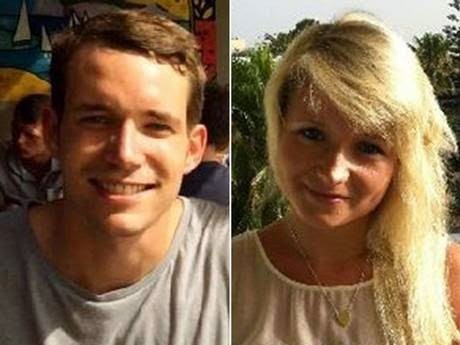 The murder of the two British tourists on Koh Tao was a shock to everyone. Such a beautiful and generally trouble free island with thousands of tourists visiting every year. My heart goes out to the family and friends of these young people who were in the prime of their lives. The small community here is devastated by these attacks and is in a state of mourning. Last night a candlelight vigil was held on the beach and flowers were laid on the popular and beautiful Sairee Beach where this gruesome event took place. There is much speculation and miss reporting surrounding the event and the events that followed. As usual there were many of us enjoying the entertainment on Sairee Beach that night and the police have their work cut out but it would appear they are doing all they can and eliminating as many as possible as quickly as possible. All we can do is let them do their job and hope they find the killer soon. Koh Tao is NOT on lock down and ferries are running to and from the island as normal. This spider is for display purposes only! I leapt backwards whilst a little yelp (not unlike a small puppy who had just learnt not to get under your feet) escaped my lips before I could collect myself enough to stop it! 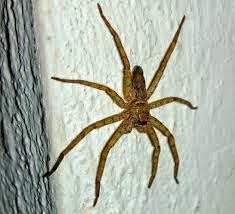 The site of the Huntsman spider who had decided to join me in the shower had not been enough to release this involuntary noise. However, as I tried to scare it off by spraying a bit of water next to it, I had not expected the sheer olympic speed at which it would react and dart around the walls of our shared confined space in a panic stricken dash to escape! "These spiders are fast" I thought as I hurled myself out of the nearest (and only) exit in not too dissimilar a fashion as the spider! "Is that a spider?" shouted Kerry from the next room. Slightly embarrassed for my reaction I replied "Yes. ITS MASSIVE. AND ITS REALLY FAST!" feeling the need to justify my reaction! "Ha ha! That will be a Huntsman" came the helpful reply! Should I stay on this route? Making a decision when tired is never a good idea so I decided to sleep on it. 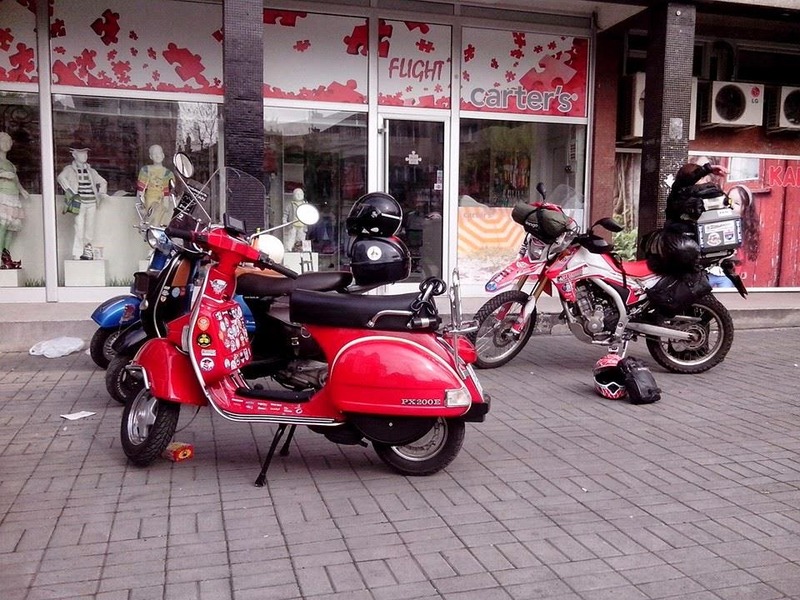 In the morning, my riding gear still wet through and smelling of damp dog, I decided to miss Cambodia, take a sharp right and head for Thailand going as quickly as possible for the shelter of my friends bar in Koh Tao. This would cut my riding days down from 10 to 5. “Yes” I said. “That’s when I arrived!” That confirmed it. I needed to get off this path and hope these clouds would set their sites on some other poor soul. 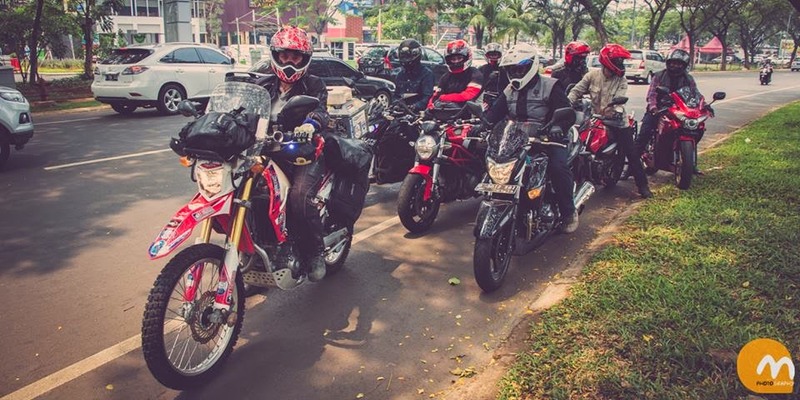 So why have so many bikers moved to Northern Thailand? If you have to ask the question you have never been to Northern Thailand! If the rich culture, the weather and the twisty roads aren't enough to tempt you then let's not forget the stunning countryside, miles of trails and of course the beautiful women! Some of them have even taken to riding bikes! I know it's amazing (yes you did detect a little sarcasm). Personally I am not looking (you know me!) but it's hard not to spot the odd dishy young man on a bike too. One of whom recognised me (well probably Rhonda) at the noodle stop yesterday on route to Chiang Rai. He decided to stop and join us for the rest of the ride. Don't mind if you do! Following Thailand's mountainous border with Myanmar over the last few days has been a real pleasure and has left me with many lasting memories. Who said adventure had to be tough? This region seems different to the southern part of Thailand and I would highly recommend riding here. The twisting roads are quiet and the people are extremely friendly. People leave you to it and charge you a fair price without the bartering. I hadn't seen any tourists along this route until today when I reached Mae Hong Son and met a Spanish couple on a hired twist and go trying to navigate a muddy section. I stopped to help of course, right after I pointed and laughed! The standard off road procedure in these circumstances. 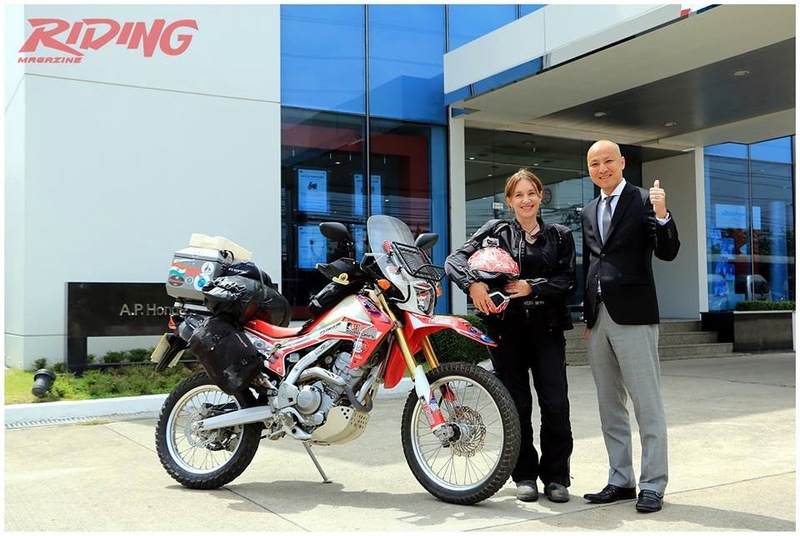 Riding out of Bangkok is a lengthy process and a laborious task which took me around two hours. However, the drivers were courteous, making way for me to filter, and surprisingly, followed the rules of the road. Since Turkey I have come to expect chaos and lack of discipline and so this came as a welcome change. Something I had really not expected of Bangkok. We make it to Thailand! Meeting the boss at AP Honda! Nepal customs were surprisingly thorough. I had to unpack EVERYTHING while they inspected it all with a fine tooth comb. I then had to remove all the fuel, disconnect the battery, lower the tyres and (to make it fit in the crate) remove the bars, mirrors, front screen and topbox. I opted not to remove the front wheel and pay a little extra for a very slightly bigger crate. I didn't know what help I would have when I arrived in Thailand and with no centre stand, it's not an easy job to put the wheels back in place. It was a decision that later proved to be the right one. "Are you going to just watch or are you going to help?" "Help" came the reply and so they did! Before I knew it my top box was bolted back in place with some new bolts from around the corner and I was waving goodbye to my new friends and to India. So how was I to know I was entering the "Gatway to God" and the biggest festival of the year in Haridwar? Oops! The Kanwar Yatra is an annual pilgrimage in the name of the Hindu god Shiva. The devotees leave their hometowns either on foot, by bike, motorbike or truck and head for Haridwar to collect holy water from the river Ganges which they then carry back to their hometowns. Since the 1990s the festival has gained a massive following and now attracts hundreds of thousands of pilgrims from the surrounding states. During festivals, Haridwar is packed to bursting and beyond. Stampedes are a regular occurrence, with 21 killed in 2003 and 5 killed in 2010; the bridges across the Ganges are the most dangerous spot. 3 mountain passes, two river crossings and a landslide! Getting to Manali was was an adventure! This highway is only open for about 4 months of the year and the average elevation is more than 13,000feet (4,000 m). It is 17,480ft at its highest point at Tanglang La mountain pass. Day 1 started fairly well. I made the Rohtang pass with no real problems. It was a stunning ride with plenty of dirt tracks and breathtaking views. Particularly riding through the Moore plains which is surrounded by stunning natural rock formations. After about 8 hours of riding I made it to a small settlement in Sarchu where I found my tent for the night. It was pretty cold here at around 15,000 feet but I had plenty of blankets and a good dinner to keep me warm. Arriving in Leh was a bit of a disappointment to start with. It was full of cars and tourists and dust and noise. Not what I had expected at all. I climbed to the top of town where it was a little quieter and found a place to stay. Wondering around I found the place to be very friendly but just a little too many tourists for me. It was full of shops selling the usual trinkets and people on hire bikes who skidded every time they stopped (lack of understanding of how the breaks work!) and revved far too often just for the thrill of the noise! I understand the buzz but found them annoying in such large numbers! 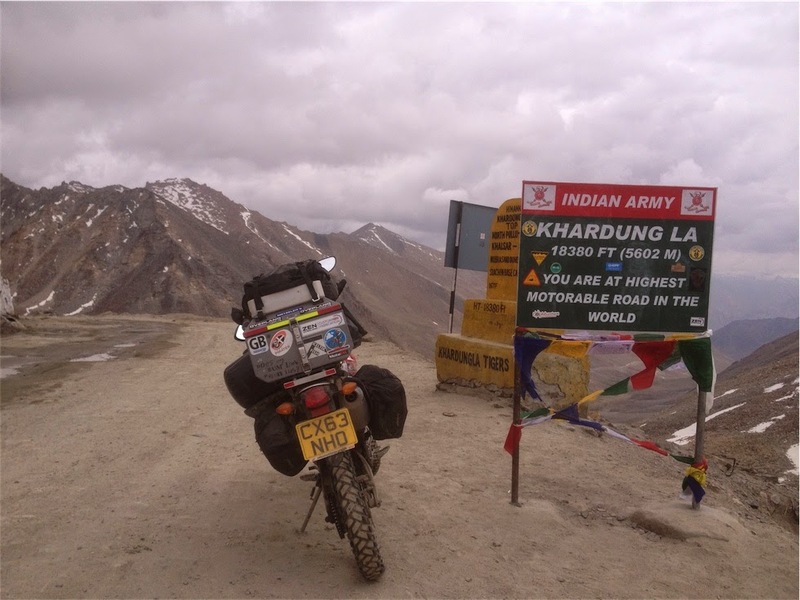 I decided to head out of town and hit the Khardung La pass. The highest motorable road in the world. It would take me two days to complete the 300km round trip and would take me up to 18,380 feet. An interesting challenge for both myself and Rhonda. It was a relief to be alone again and with a slight drop in temperature, all at once I felt like a new woman. My energy was back and my desire to ride had returned. That night, in Srinager I treated myself to slightly more than basic hotel and enveloped myself in soft pillows and a working shower. I even had sky telly and room service! It was luxury and I made the most of it. So heat exhaustion or not I was feeling a little stronger today and I was going to give it a go and see if I could make it over to Amritsar in Punjab. The Mecca for all Sikhs. This is where the famous golden temple lies. Sikhs make up just 2.5% of India’s population. Hindu being the main religion at 60% then Muslim at 30% and the final 7.5% is made up of the rest. Sikhs are easy to spot as they all wear turbans and it was clear as I entered Punjab that this is where most of that 2.5% lived. The closer I got to Amritsar it became an overwhelming majority of the population. Sorry for the radio silence. It has been a crazy week. To call it a roller coaster week would not do it justice! 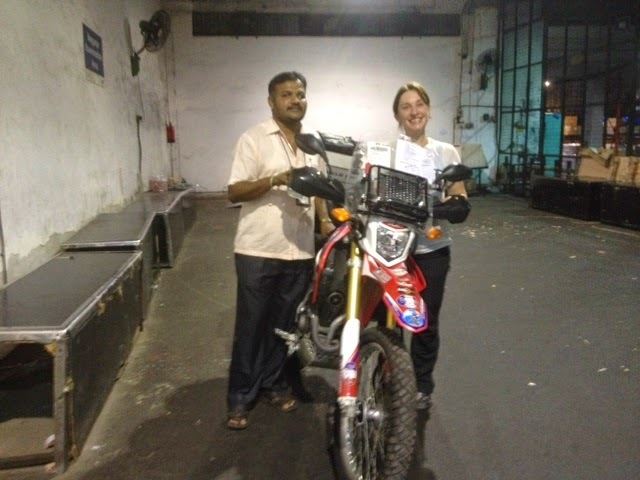 A roller coaster pales by comparison to the ups and downs of my ride in India. Feeling pretty rough right now. The last 1500 miles has been hard riding and despite resting up as often as possible, it seems to be taking it's toll. There have been some amazing moments along the way though that have made it all worthwhile. And which country are you from? Gandhi once said "At the age of 18 I went to England. Everything was strange, the people, their ways and even their dwellings. I was a complete novice in the matter of English etiquette and continually had to be on my guard. Even the dishes that I could eat were tasteless and insipid. England, I could not bare.....". Coming from Wales I have to agree with him! They are a strange bunch! (Just kidding. Calm down!). However, it just goes to show that it works both ways. The cultures are so different despite the fact that India was under English rule until as late as 1947 and our culture is probably just as alien to other people looking in. Unlike Gandhi though, I am enjoying the culture shock immensely! 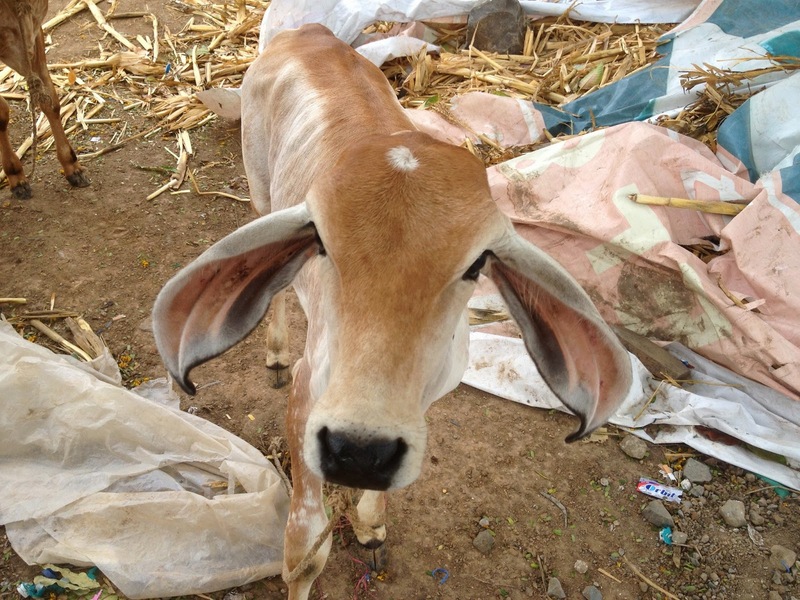 Is it a cow or is it Bambi? I woke with a start (actually I jumped 3 feet in the air) as I felt a scraping on my foot and looked up to see said mouse at my feet on the bed! As I screamed, the mouse jumped off the bed and back in to its hiding place behind the cupboard. Poor thing was terrified no doubt. I found it on the chair next to the bed 20 minutes later and managed to finally get it out and in to the freedom of the corridor! I didn't sleep much after that. It was too late! I was awake!! I tried counting cockroaches but it didn't help! I was also eaten alive by mosquitos and possibly flees! I wont be recommending that hotel on Trip Advisor! It was disappointing to arrive in India by plane. The airport did not seem appropriate for this adventure and being without Rhonda for the first time was strange. I went through the usual ritual of being ripped off by the airport taxi (here comes some more fresh bait) and arrived at the hotel a few minutes and a short conversation later. I finished arguing over the price with the driver and stepped out to be greeted instantly by Alex and Vidya who had travelled the 14 hours from Goa by jeep to help me in any way they could in my first few days. My heroes for sure! Not long now until I board the plane and say goodbye to Dubai for a while. Rhonda SHOULD already have taken off by now and I hope we can be reacquainted without too many headaches on the other side. I will arrive armed with biscuits, water and lots of patience just to be on the safe side! Getting her on the flight was only complicated by the missing paperwork incident! Paperwork that SHOULD have been given to me on arrival at the port. Paperwork that was required to get Rhonda out of the country. It was an import form that was in addition to the import stamp on my carnet and clearly something I had no idea about until it was requested by the customs officer at the airport. 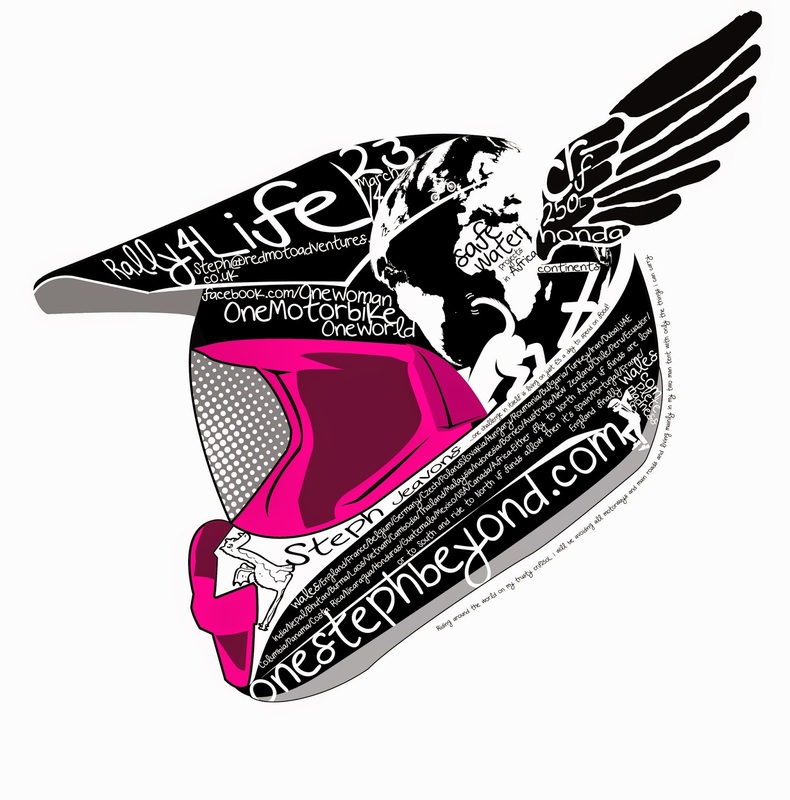 Please check out the link and get yourself a funky new t-shirt or hoodie.. This T shirt has been designed by Paul Tomlinson. A biker and all round nice guy who I met at Bikers Cafe in Dubai. I could see Dubai! I could actually see Dubai. 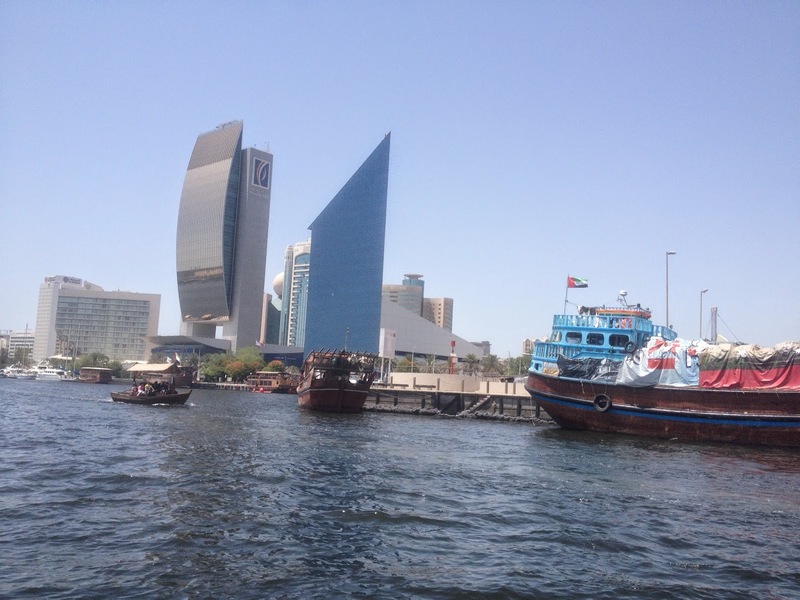 I don’t mean as an pin on my map this time but I was actually on a ferry on the Persian Gulf and heading in to the Port of Dubai. Was that the Burj Khalifa I could see in the distance? It was the biggest moment of realisation so far. Don’t ask me why. It was just like I had woken up after a long sleep (which actually I had) and found myself still in the dream. What an amazing feeling. I hope I have many more to come. You have to be confident to start a trip like this. You have to put your fears to one side and say “I AM going to do this” and you have to believe it but I guess a part of you never really believes it until you are there and doing it. Before then it’s really just talk! The Nokia ringtone will now forever transport me back to Iran! Perhaps it is another "forbidden" to change it! EVERYONE, it seems had it as their ringtone in Iran! This was particularly apparent in the ferry port offices where there were lots of people with lots of phones and no exceptions! I even had it myself on my iranian phone! got to within one hour of the port I hit what I can only describe as a wall of humidity. It was bizarre. The change was that sudden. Luckily I didn't have that far to go and I patted myself on the back for getting up early to avoid the worst of the heat. 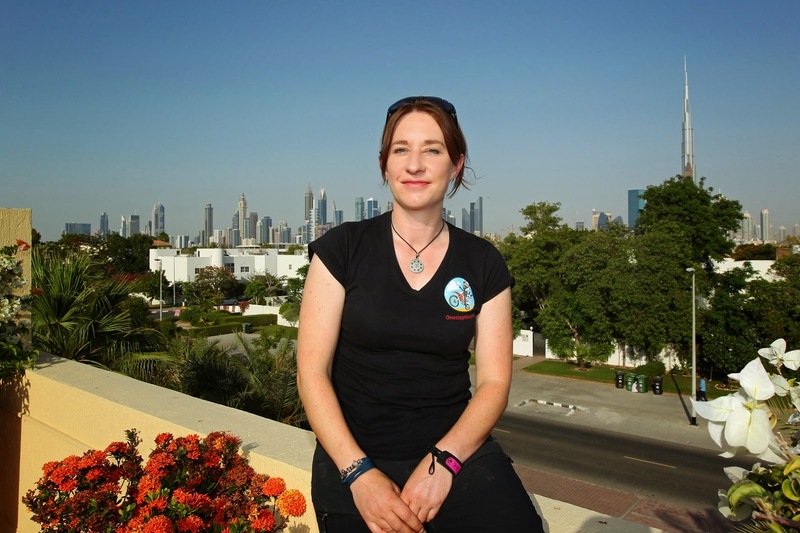 I had expected to spend the next two days sorting out paperwork for the bike before sailing on Tuesday to Dubai. It turns out I was to leave Iran that night. The desert wind was relentless but we rode on dodging the tumbleweed and trying to avoid the bigger dust devils. When they did hit they hit hard and threw us from one side of the road to the other and back again. 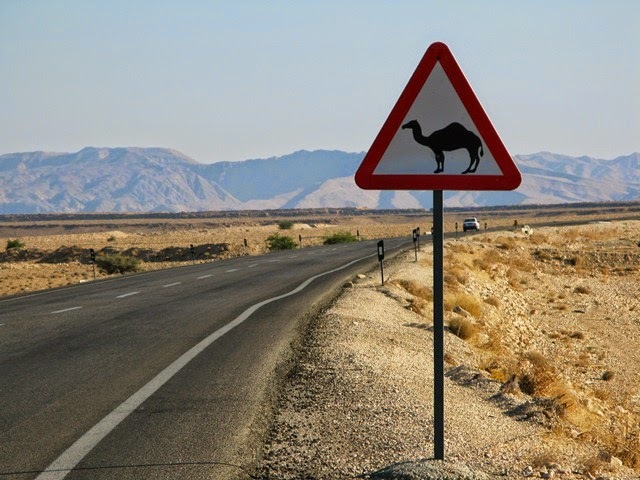 We had 235 miles to ride in these conditions if we were to make it from Yazd to Percepolis and it was hard work keeping the rubber side down. Rhonda used up more fuel that usual. I think it was due to the constant battle against the wind. I had certainly used up more energy so I can only assume the same applied. "To the Towers of silence driver, and step on it!" I cried with a giggle as I lept in to the back seat of our Taxi. Max, the golden haired 21 year old from Holland jumped in the front seat and Sophie, the chatty Belgiun lady, from London climbed in next to me. Max agreed "Go for it mate, we want to catch the sunset". Sophie had other ideas "There's no rush! Please take your time"
The driver seemed to be just waiting for an excuse to drive like a hooligan (I know the feeling) and so the next 15 minutes was a crazy dash through the city, skimming other cars, bullying our way through the traffic and shouting at people to get out of the way. This was an emergency! I laughed as Max jumped to the other side of the seat when he thought we were going to hit something. It really was that close at times! Poor Sophie managed to stay calm on the outside and gave up suggesting we slow down. I think she secretly enjoyed the ride as did the rest of us! Always leave while your Hijab is still wet. There is real freedom in wild camping. No onlookers! What do you do when you find yourself wild camping with 15 bikers? Get them to change your tyres of course! Evidently this took one main man, several supervisors and one to hold the hijab while I handed tools out and ensured the supervisors where supervising correctly! It was lovely to have company from Urmia over to Sanandaj and great to spend time with my dad. 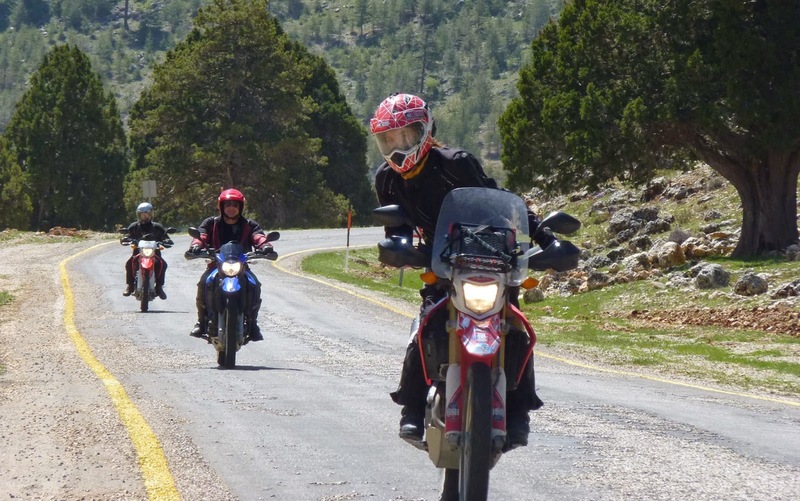 I embraced the chaos of the tour and the traffic the next morning as we rode out of Urmia together and hit the road for a mere 300Km (very low miles for a NS day). Photo borrowed from Andy's facebook (Nicks group)! 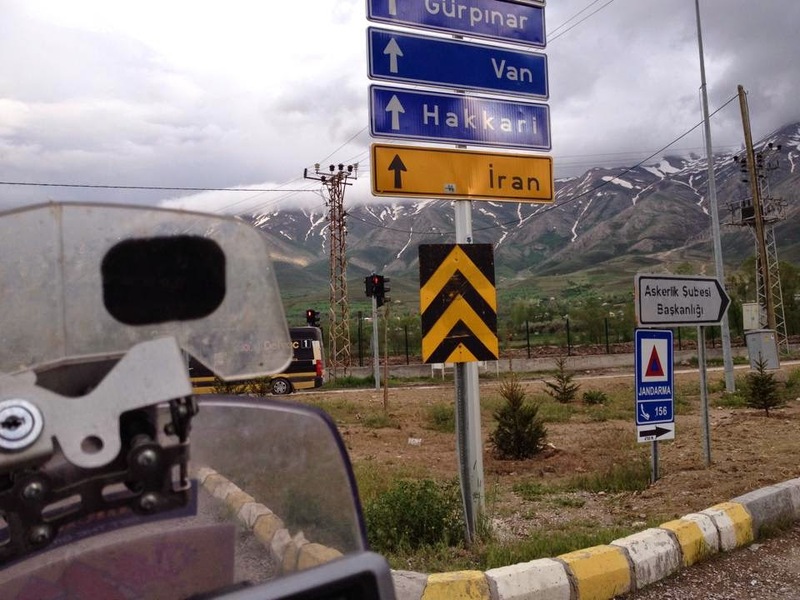 I arrived at the Iranian border hot, tired and a little agitated!Not a good state of mind to arrive if it can be helped as there is a lot to deal with once you cross that line. I hate feeling rushed and this was the case today. I had been overwhelmed by the beauty of the mountains, missed my turn and gone 20 miles before noticing my mistake. GPS down and relying on checking my map and road signs, I just carried on. It could have been worse. Initially I thought I had gone 40 miles out! My ride from Van was otherwise uneventful despite my concerns. I was nervous for the first 40 miles having been warned not to take this route as apparently the mountains were full of Kurdish PKK militants who were known to stop people on the road and at best demand money. I chose to ignore the warning and ride on through, knowing that several people did use this route on a daily basis and I guessed it would would be particularly unlucky to have any trouble. It has been a real pleasure meeting the Kurdish people in the East of Turkey. They make sure I know they are Kurdish as I make sure they know I am Welsh! Very proud people and great at washing bikes it seems!!! I have been a great source of amusement to everyone of them I have met. 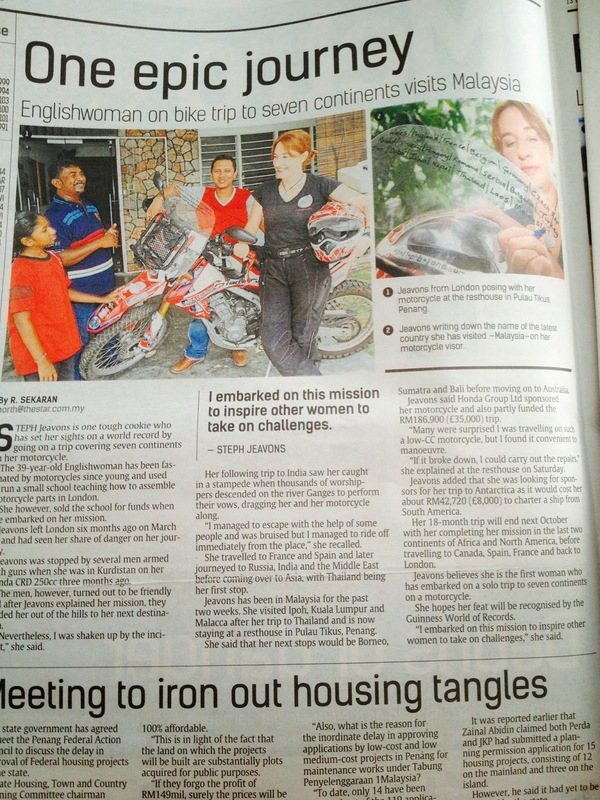 No charge for tea once again and always want to know about the bike and how much she cost. Always respectful and always time to help me on my way. Turkey has been a real pleasure all together. A beautiful country full of wonderfully kind people. Thanks to everyone who has put me up and showed me the best of it along the way. My home is yours if ever you come to Wales (when I get one that is!!). The weather has not been too kind to me over the last couple of days so I have spent a lot of time riding in the rain. I still made it to Capadoccia in good time after leaving Kas and had a lovely walk in Ihlara valley (the sunken city). It was a long climb down to the valley floor and an even longer climb back up! I was drenched by the time I got back to the bike. Rain soaked outer layer and sweat soaked inner layer all being held in by the waterproofing in the middle! Nice! It was a lovely experience all the same and the car park attendants found my drowned look amusing so it was worth it! I clocked the open window as the dishevelled man led me from the dark corridor and in to the small room. The room had 3 beds and I found myself listening for the click of a lock as he shut the door behind me. It didn't come. I hear his footsteps as he walks back up the corridor and close the second door leading to the garage front where my bike was parked. I wait and listen. Still no sound. Phew! My attention turns to the job in hand. I quickly take off my boots and and trousers and slip on my waterproof liners. Then the jacket. I try to not to rush. Its like when you walk home in the dark and get spooked by a sound and don't want to start running because it only accelerates the paranoia as you have accepted there really might be something there to be scared of. I don't hang around to zip the liners in place though and go straight for the boots. Before leaving home I was lucky enough to enjoy the splendid culinary skills of my friend and house mate, Tom and one of my best friends of many years, Wozzy (Warren). Both love cooking and are brilliant at it. It is traditional in my house for Wozzy to do the Sunday roast and between them they tend to take over the kitchen during the week as well! We all know what we are good at and generally stick to our corners. Personally, I am good at eating! The same catchphrase would be announced as I reached for each home baked Viennese whirl. It was a great excuse and one people seemed to accept willingly! It has been exactly one month since I waved goodbye to my friends, family and a whole host of bikers at the Ace cafe, and hit the road. It seems a lifetime ago that I was standing on top of the roof of that iconic building and waving to the crowds below! Did that really happen? "Look at me ma! Top of the Ace!" In the space of around 3 weeks I travelled 3,500 miles on Rhonda and, if you count the UK, ridden in 10 countries. forward to hitting the road again tomorrow. As I sit overlooking the busy Bosphorus Straits which connect the Black Sea with the Sea of Marmara and tuck in to the best Kofta Kebab I have ever tasted without being drunk, I find myself slipping in to contemplation mode (ok so you cant say I didn't warn you!). I realised how lucky I am. Many a time I have preached that there is no such thing as luck. "You make your own luck. Good or bad. It is a matter of choice". And while I may be able to sit here and be proud that I have (in the words of Adele) thrown my soul through every open door (on some occasions I have beaten a hole through the wall with my head! ), there are factors in life that perhaps cannot be changed for some people. The cards we are dealt can be manipulated for sure but some circumstances just won't give. 30 miles from Kemal's place, heading into one of the largest cities in the world and my Garmin decides to stop working! The roads quickly turning from a gentle trickle to full blown unforgiving rapids. I interpreted the road signs to read "No rules apply". "OK don't panic. Find somewhere to pull over and you can figure this out". I needed to get my bearings and I needed to unpack my "bring it on" head. I also needed to strip off some layers and lose the earplugs. I prayed that a quick reset of the Garmin would see it working again. I left Belgrade yesterday with a a full belly, new friends and my Buff smelling of fabric conditioner. Life couldn't be better! Sean and his very soon to be wife, Tamara, have a great flat in central Belgrade with a basement car park for Rhonda, a spare bed and a very warm welcome for stray bikers like myself. I was looking forward to finding out all about Sean's own world trip which he completed 2 year ago. 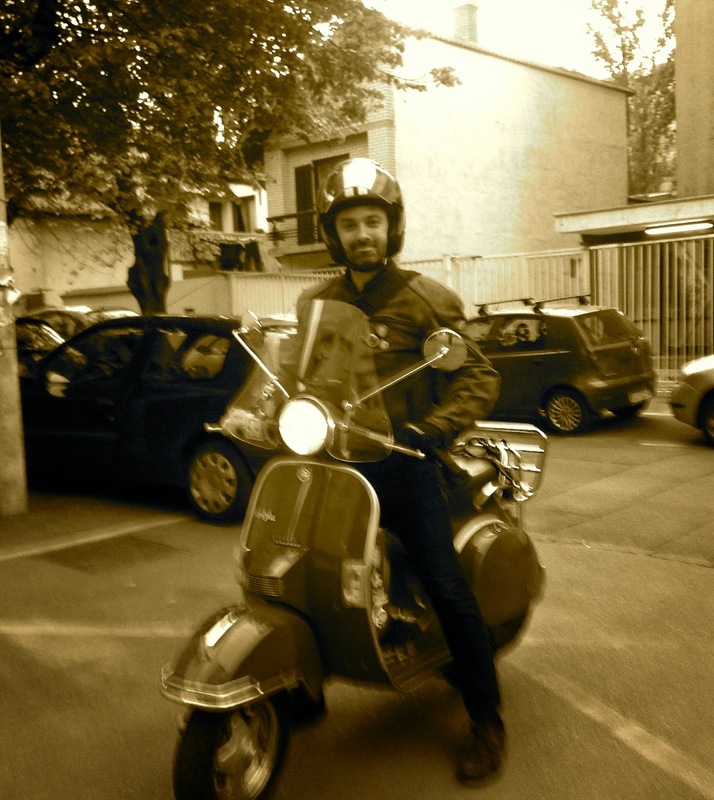 18 months on the road with nothing more than a fully loaded Vespa and a heavy dose of optimism. Some of the photos from his trip were displayed on the walls and it was great to look at them and imagine my own walls full of similar pictures one day. Where those walls will be is another question all together and one I don't care to worry about. In fact it is all part of the adventure and the not knowing is exiting! Sean, a Canadian, had ended up here, in Belgrade, with a wonderful Serbian wife to be and a book on it’s way. I look forward to receiving my signed copy just as soon as it’s finished (hint hint)! Having left the twisties of Romania behind on Sunday I headed for a border town ready to cross over in to Serbia in the morning. I picked a name on the map and headed for it. On arrival though, it was not a great place to say the least. This place was a dump, with nothing but bordered up hotels and truck drivers everywhere. It had looked so promising on the map, situated on the river and surrounded by forest. Sometimes things only look good on paper. This was one of those times! I must admit to blasting through Hungary with just the one stop in Budapest with my lovely hosts Llona and Csaba who spent their whole afternoon taking me around the sites of Budapest. Another very interesting and beautiful city with it's chain bridge between Bud and Pest, the houses of parliament and the many cathedrals. I was quite surprised at how considerately everyone drove as I entered the city. I have become accustomed to people driving up my rear end and expected worse to come in Budapest. Not so. They kept their distance and I had no problems at all. Even the lorry drivers were considerate! Amazing!